This next interview is brought to you from New York based artists Micah Ganske and Robin Williams. Both artists met when sharing a Brooklyn studio space which is appropriate because these two painters spend countless hours developing their art. Both Williams and Ganske are not your traditional figure painters, their process vary yet both share a kinship to concept; pushing the viewers into being voyeurs of beauty within the oddest of circumstances. Both talk about their latest series of works, Williams about her first group portrait based off of a fictional group of lengthy teens and her latest paintings based off of her sculptures. 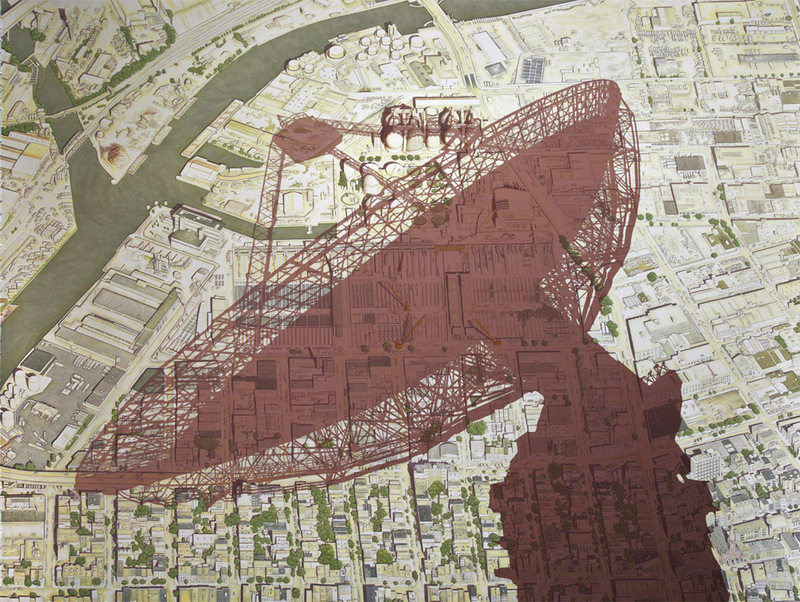 Ganske talks on his latest series of Aerial paintings of various american towns; some that have been abandoned and those that have been over occupied. Ganske is currently on view until November 10th, at RHGallery showing one of the works in the series which he hopes to have complete sometime next year. Williams will be showing her work at P.P.O.W. sometime this Spring. Many thanks to both artists in doing this interview for AFA! AFA Interview: Robin Williams and Micah Ganske Fireside Chat from Artist For Artist on Vimeo.